Ithaca Capital is pleased to announce that it has entered into a partnership for the Marriott Residence Inn hotel, Panama (the “Hotel”). The Hotel, which is scheduled to open in the second half of 2019, features 144 extended stay hotel rooms with a kitchenette, as well as restaurant, pool and other amenities. The Hotel is situated within Pacific Center, a mega-development with more than 2 million square feet of space which includes a world class hospital (Panama Clinic), a shopping mall, a supermarket, a cinema, a performance arts theater and extensive office space. Ithaca Capital will partner with the existing owners at undisclosed terms and also assume asset management responsibilities. The Hotel shall be managed by Marriott Hotels under a long term hotel management agreement. 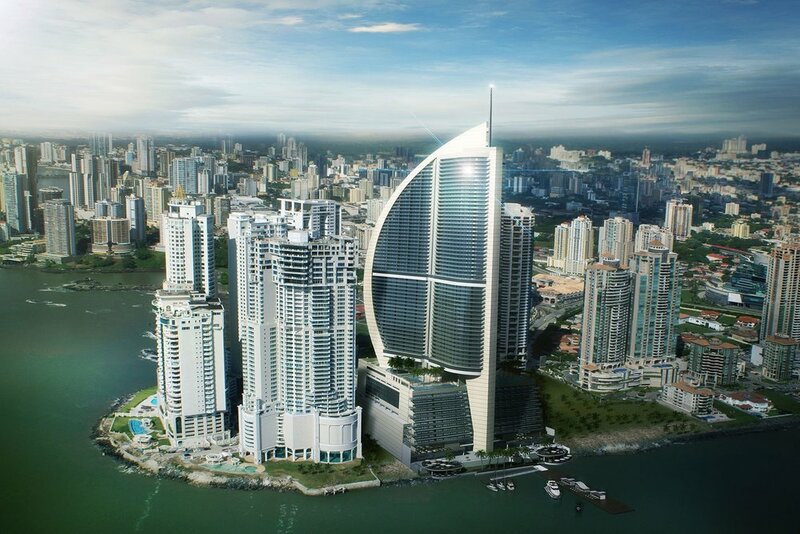 Ithaca Capital today announced that the iconic Bahia Grand Panama Hotel in Panama City, housed in the tallest building in Panama and Central America, is set to become a JW Marriott® hotel. The hotel, which originally opened in 2011, has been operating as an independent property since March 2018. Ithaca Capital, Hotel ToC and Marriott International signed agreements to rebrand the hotel as a JW Marriott, under a long-term management contract with Marriott International. "We are thrilled that our hotel will operate as a JW Marriott and we believe that this partnership, together with a talented team and spectacular hotel amenities, will be a success. We look forward to welcoming new and returning guests to this iconic property," said Orestes Fintiklis, managing partner of Ithaca Capital. At 284 meters (932 feet), the property’s modern architecture has become emblematic of Panama City and its skyline. Located at the ocean front of Panama City’s prestigious Punta Pacifica neighborhood, close to the banking, commercial and entertainment areas, the hotel offers the seclusion and privacy of an urban oasis. Guests will be able to enjoy three world-class restaurants, a popular bar (Cava 15), an expansive pool deck and a state-of-the-art conference facility. Averaging 600 square feet each, the hotel’s 369-rooms are the largest in the city with many directly on the oceanfront enjoying open views of the Gulf of Panama and the city’s skyline. JW Marriott is part of Marriott International’s luxury portfolio and consists of superb and distinctive properties at key urban and resort locations around the world. Today, there are more than 80 JW Marriott hotels in over 25 countries and territories. “Marriott International is proud to partner with Ithaca Capital for the re-launch of this iconic hotel in Panama City, a growing gateway city and a critical hub for Latin America. This hotel will represent the twelfth operating JW Marriott branded hotel in our region, catering to sophisticated travelers, seeking the world-class JW Treatment™,” said Laurent de Kousemaeker, Chief Development Officer, Marriott International, Caribbean & Latin America Region. Ithaca Capital Partners, a real estate investment management company, is pleased to announce the execution of a binding agreement between a holding company (the “Buyer”) and Caribbean Property Group (the “Seller”), for the acquisition (the “Transaction”) of a portfolio of Hotel assets (the “Portfolio”). The Portfolio includes the Marriott Courtyard Hotel in Santo Domingo (Dominican Republic) and the Marriott Courtyard Hotel in Escazu, San Jose (Costa Rica). Both properties are managed by the Marriott organization. The San Jose property comprises 120 keys, a food & beverage outlet, meeting space, parking spaces, outdoor pool, fitness center and other amenities. The hotel is located in the western suburb of Escazú, along the Próspero Fernández Highway and six miles from the Juan Santamaria International Airport. The Santo Domingo property comprises 145 keys, two food & beverage outlets, meeting space, outdoor pool, parking spaces, fitness center and other amenities. The hotel is located along Avenida Máximo Gómez in Santo Domingo. The acquisition includes an adjacent land parcel for future development. CBRE Miami and Duval & Stachenfeld LLP advised the Seller and Aleco Haralambides law firm (Miami), Pragma Legal (Costa Rica) and LMV Law firm (Dominican Republic) advised the Buyer. Ithaca Capital Investments, an investment company comprising of family offices from the United States, Latin America, Europe, Asia and Panama, and its investment manager Ithaca Capital Partners, are pleased to announce the completion of the acquisition (the “Transaction”) of the hotel amenities and the majority of the condo hotel units (the “Property”) of Trump International Hotel, Panama (the “Hotel”). The Transaction was consummated as part of a consensual process involving bondholders, original property developer and prior owner, and Trump International as hotel operator. The Hotel, which opened in 2011, features 369 luxurious condo-hotel units as well as world-class restaurants and conference facilities within a 70-storey tower, the tallest building in Central America and a regional landmark, impeccably designed to evoke a majestic sail fully deployed in the wind. Canal bank provided debt financing to the transaction, Berkeley Research Group, CBRE, Perkins Coie LLP and Britton & Iglesias advised the sellers and Alcogal and BDO advised the buyer. © Ithaca Capital Partners 2017. All Rights Reserved.